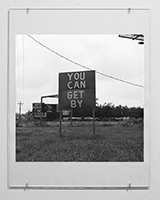 The title of the New York photographer’s black-and-white series “trip, 1993-1999” is lowercase for a reason: the fifty small, unframed prints, mounted in a continuous dark stripe around the gallery, are a quiet critique of the male-dominated canon of the road-trip picture, in the tradition of Robert Frank and Garry Winogrand. Like her predecessors, Lipper documents her travels in telling fragments, contrasting the romantic myth of the American West with the country’s mundane interiors, humble structures, and tumble down signage. But, in a subtle departure, she leaves traces of her own presence in unpeopled shots. In one image, an untouched Waffle House breakfast rests on a table; in another, the word “motel” is written in soap on a mirror. One of the few figures in the mix suggests a surrogate for the artist—a female mannequin dressed in flannel and jeans, leaning against a tree.